"This classic piccata sauce is also a traditional accompaniment to veal medallions." Whisk together flour, black pepper, and paprika in a shallow dish. Dredge the chicken pieces in the flour mixture, coating evenly; set aside. Heat olive oil in a large skillet over medium-high heat; stir and cook the garlic until light brown, about 1 minute. Remove the garlic from the skillet and set aside. Place 2 tablespoons of butter into the skillet with the olive oil. Cook the chicken pieces in the oil and butter over medium-high heat until brown, about 5 minutes per side. Remove the chicken from the pan and set aside. Pour the wine into the hot skillet and bring to a boil over high heat, scraping the browned pieces from the bottom and sides of the pan. Boil the wine until it is reduced by half, about 5 minutes. Whisk in the chicken broth, reserved garlic, lemon juice and capers. Cook for 5 minutes over medium-high heat. Stir in the remaining 2 tablespoons butter and parsley. Return the chicken pieces to the skillet and continue cooking over medium heat until the sauce thickens, about 15 minutes. Meanwhile, fill a large pot with lightly salted water and bring to a rolling boil over high heat. Once the water is boiling, stir in the angel hair pasta, and return to a boil. Cook the pasta uncovered, stirring occasionally, until the pasta has cooked through, but is still firm to the bite, 4 to 5 minutes. Drain well. Remove the chicken pieces to a serving dish and drizzle with a few tablespoons of the sauce and capers. 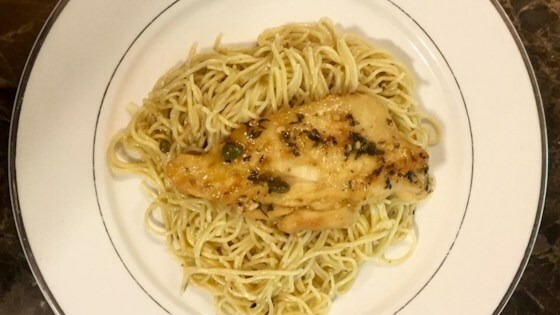 Place the cooked angel hair pasta into the skillet with the remaining piccata sauce and toss to coat. I thought this dish was just perfect in every way and was loved by my family. We're garlic lovers so I did add more than suggested, otherwise, didn't change a thing. Thank you so much Reeni! Recipe is delicious, however it is greatly improved by a fairly generous dose of fresh minced garlic and onion. So tasty! The garlic really did it for me but be careful with the lemon it can overpower the parsley. This was such a hit in my house that my husband asked me to add it to our "Go-To" recipes list whenever we have company. I didn't change a thing, and it was wonderful!